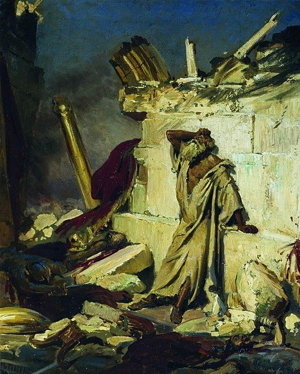 Ilya Repin’s painting of Jeremiah among Jerusalem’s ruins. One Jackson Browne song describes the atmosphere well—light-filled. Streets are lined with it. Shoppers’ faces glow with it. The angels, reindeers, and stars are already attached to the street lamps where I live. Even light crackles in homes, families and friends gathering, thankful for these graces. When Jeremiah proclaims hope for Judah, his promised future seems quite similar to Browne’s description of our prolonged Christmastide. There will be voices—of mirth and gladness, of brides and bridegrooms, of praise and thanks. There will once again be pastures, because there will once again be flocks. And all the people in Judah will be counted once again. Jeremiah’s hope doesn’t emerge in the promised land and its parties, but in a wasteland stripped of every voice and of all life. The wasteland is tempting to miss, or at least push out, at Christmas. Hear the abundance of Browne’s descriptions. “If the generosity should seize us,” we give to our families, and even the poor. This week’s passage reminds us that this a season that places us in wastelands and challenges us to ask why and to ask how. Jeremiah’s hope is expansive—a promise for our inner lives and our interpersonal relationships and also our shares in creation. Where war had wasted life at an ecological, economic, and spiritual scale, Jeremiah preaches that none of God’s creation will be wasted, that all of the family will be counted. Advent may remind us that the best hopes come from the wasteland, but it also encourages us to trust that these promises have already started becoming real. • Where are the lives of people and the sanctity of creation wasted? What systems create this waste? What is your relationship to these systems? • How do privileges, luxuries, or promises affect our relationship with waste? Explain. • How can we work to make sure that all of God’s people are counted among us? What might this look like in our world today? How might we practice counting this Advent? The second segment (vv. 19-22) grounds the covenant promises to David and the Levites in God’s covenant with Noah that “day and night shall not cease” (Gen 8:21-22; see 9:8-17). If anyone could break that covenant, and that is impossible because it is an unconditional covenant to which (only) God is bound, then God would break the covenants with David and with the Levites (or house of Aaron). In other words, with God these promises are a sure thing. Then a second, related promise is made to David and the Levites, namely, that their offspring will increase. This promise, too, is grounded in creational realities (see 31:35-37). This promise is just as certain as it is impossible to number the stars or measure the sands of the sea (see Gen 15:5; 22:17; 32:12 and the link back to the promises to Abraham, Isaac, and Jacob in v. 26; see also 30:3; 32:22). The point is not that their offspring will be as numerous as the sand/stars, but that the increase of their offspring is as certain as the impossibility of counting the sand/stars. The third segment (vv. 23-26) continues the linkage between the promise and creational realities, only this time the context is polemical. God asks Jeremiah to observe how certain people are making disparaging comments about Israel, and this in two respects. On the one hand, they claim that God has rejected the “two families” (probably royal and priestly families given the context, though some interpreters consider this a reference to Israel and Judah). On the other hand, they hold “my people” in contempt and without national stature because their God has rejected them and driven them into exile and landlessness. The future of leaders and people are tied together. “These people” are unidentified but they are probably other nations (see v. 9) or the Babylonians among whom the people of God were exiled (see 22:8-9 for the sophisticated assessment on the part of the nations); the words are general enough to fit any situation. In the face of this contempt, God reiterates the promises. This time, however, the Levites are left aside, and the entire people of Israel (“offspring of Jacob”; “the offspring of Abraham, Isaac, and Jacob”) join the members of the Davidic line as the recipient of God’s sure and certain promises. The promissory reference to the entire people refers back to the promises of 31:35-37. Yet, the promises to the pre-Sinai “ancestors” may also be in mind given the triad Abraham, Isaac, and Jacob; this is the only such reference in Jeremiah (yet, see the reference to the “ancestors” in 11:5; 30:3; 32:22 and the images in v. 22). This time the grounding of the promise in creation is somewhat more expansive. The sure and certain creational realities are no longer simply the covenant with “day and night” (see v. 20), but also the covenant with “the ordinances of heaven and earth.” In view of 31:35-37 (see also Ps 89:36-37) these “ordinances” may refer to all the other orders of creation (Gen 1). In the face of those who would claim that Israel’s election has been forfeited (v. 24), these ongoing promises are articulated. Destruction and exile are external signs that may suggest to observers that Israel is no longer the chosen of God; but external realities in fact mask God’s continuing commitments to this people. The offspring of Israel from every future generation can count on these promises come what may, even something as horrid as another destruction and exile. Terence E. Fretheim, Jeremiah, Smyth & Helwys Bible Commentary (Macon GA: Smyth & Helwys, 2002), 479–80.